I dare say that we ate the last BBQ dinner of the year tonight! 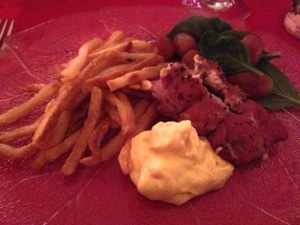 We didn’t really know what to make until we went to the meat shop and saw pork tenderloin. 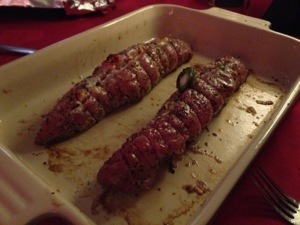 Felt like a long time since we made a stuffed pork tenderloin. 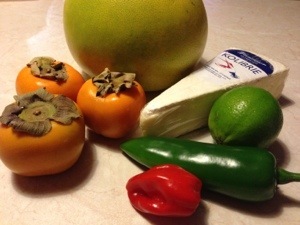 At the grocery store we debated a little of what items to stuff the meat with but finally got: a creamy brie cheese, Sharon fruit, honey pomelo, lime, jalapeño and habanero. Hubby cut everything in smaller pieces and filled up the pork tenderloin. 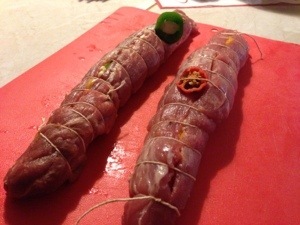 One piece with habanero and the other with jalapeño otherwise the two tenderloins were identical. 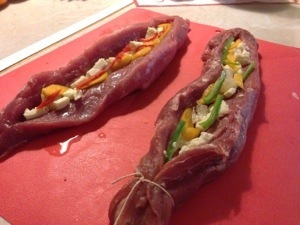 Next he used a butcher string to tie around the meat and to hold everything together. Time on the BBQ was around 25-30 minutes using indirect grilling. When ready to serve remove the butcher string.